The Pentagon has upgraded and tested the largest bunker-buster bomb in the US, powerful enough to disable Iran’s most heavily fortified nuclear facilities in case of failure to reach a nuclear deal, a senior US official told the Wall Street Journal. According to the Wall Street Journal report, work on the bunker buster (the so-called Massive Ordnance Penetrator, or MOP) started before the latest round of talks with Iran. The most recent testing took place in mid-January, when the improved bunker buster was dropped at a testing site at an undisclosed location by a B-2 bomber that took off from Whiteman Air Force Base in Missouri, officials told the publication. The Wall Street Journal reported in 2012 that according to Pentagon war planners the 30,000-pound (13,607 kg) bunker buster wasn’t powerful enough to destroy some fortified Iranian nuclear facilities. So work reportedly began to upgrade the bomb’s design and guidance systems. According to senior officials, the results show the improved bomb—when dropped one on top of the other—is now more capable of penetrating fortified nuclear facilities in Iran or in North Korea, The Wall Street Journal reported. The Pentagon also designed the bunker buster to challenge Iran’s Fordow facility, which is built into a mountain to protect it from potential airstrikes. Upgraded electronic countermeasures have been added to the weapon to prevent jamming of its guidance systems by Iran, the source said. Electronic jammers could be allegedly used to throw an incoming bomb off target. It's believed that the above mentioned measures will allow the destructive weapon to be targeted with a precision previously possible only for far smaller guided US bombs. Pentagon officials have allegedly shared details about the bomb's capabilities with Israeli counterparts, showing demo videos of the weapon hitting a target during testing. 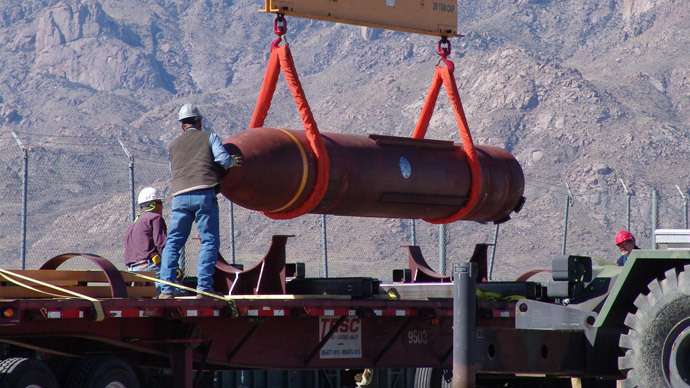 In one of the videos, described by US officials, a massive ordnance penetrator is seen dropping toward a large “X” target at an undisclosed test site. The picture then cuts to depict the site’s destruction. On Thursday, after 18 months of negotiations, Iran came to a preliminary agreement with China, Russia, France, UK, US and Germany (P5+1) on Tehran’s nuclear program. US President Barack Obama called the long-awaited agreement, reached in Switzerland, a “historic understanding” that would prevent Iran from obtaining nuclear weapons, while getting relief from international sanctions. The sides are expected to sign an agreement by June 30. In an effort to "sell" the deal to the American public, Obama said he sees it as the best way to avoid another war in the Middle East. The US has fought long wars in Iraq and Afghanistan since 2001, and is currently busy carrying out airstrikes against the so-called Islamic State militant group. "Do you really think that this verifiable deal, if fully implemented, backed by the world's major powers, is a worse option than the risk of another war in the Middle East?" Obama said. Listing three options for curbing Iran's nuclear ambitions, he said that while the first would "peacefully prevent Iran from obtaining a nuclear weapon", the second option is: "We can bomb Iran's nuclear facilities, thereby starting another war in the Middle East and setting back Iran's program by a few years - in other words, setting it back by a fraction of the time that this deal will set it back." The preliminary agreement reached on Thursday envisions Iran operating just one uranium enrichment facility: the Natanz facility that will be scaled down to 5,000 centrifuges. The fortified facility at Fordow will be converted to a nuclear physics and technology research center, while the reactor at Arak is to be redesigned as a heavy-water research reactor, and will not produce weapons-grade plutonium. All spent fuel from the reactor will be exported.